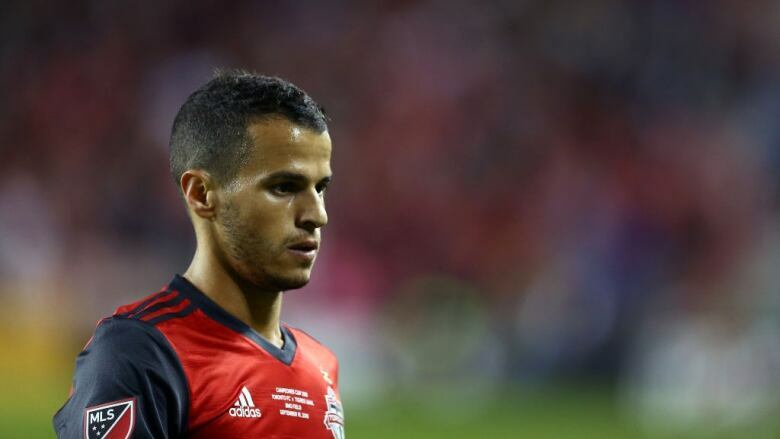 Toronto FC has sold star striker Sebastian Giovinco to Saudi Arabian club Al-Hilal FC. TFC had been in daily talks with Giovinco's agent about a new deal, according to team president Bill Manning. The Italian was the top earner in MLS last year at $7.115 million US. "They [the Giovinco camp] don't like it," Manning said in an interview Tuesday night. "He leaves Toronto as the greatest player in club history," Manning said graciously. "We wish Seba and his family nothing but the best as he begins a new chapter." The former MLS MVP had missed pre-season training this week in California with a club spokesman saying Giovinco had been excused due to "leg tightness." Giovinco's contract negotiations had been "heightened" by external pressures, according to Manning, with the presence of so-called soccer brokers, well-connected promoters who look to strike deals that agents then attempt to consummate with the clubs in question. "His departure presents both challenges and opportunities," Curtis said of Giovinco. "Obviously, replacing a player like Sebastian is difficult, but we are working diligently and are confident that we will be adding a new designated player in the near future who will be an exciting addition to our team." "One for the ages," MLS executive vice-president Todd Durbin said in awarding Giovinco the Landon Donovan Most Valuable Player Award. "He exploded and the locker room felt it," coach Greg Vanney said at the time. "Some of the chairs and various things felt it. He's passionate about winning."